As the weather did not allow observations the past week, some news from my asteroid searches. Whenever I want something to do in the evening and it is clouded (so I can't observe satellites) and the TV is dull -which it usually is-, I turn to hunting for new uncatalogued asteroids in NEAT archive imagery. Today's DOU MPEC 2009-B61 contains four of my new asteroid finds of last week. One of these, 2002 WG29, is a Jovian Trojan, my third Trojan discovery (the other two are 2001 SD355 and (203865) = 2002 WV27). Among the other discoveries of last week are two Hungaria asteroids. 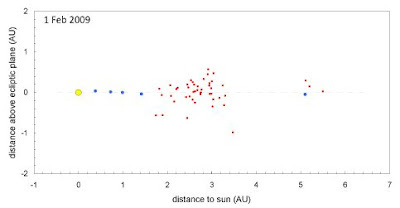 Hungaria asteroids are a special class as well: they occupy higher inclinations within 2.0 AU, a region in the main asteroid belt where at lower inclinations a stable orbit isn't possible due to perturbations by Mars. Hungaria's move in a 9:2 mean motion resonance with Jupiter and a 3:2 mean motion resonance with Mars. Hence, they quite stand out among the main belt asteroid population. 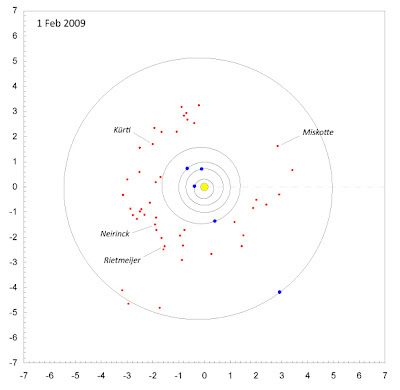 Below are two plots showing the positions in the solar system of the objects I discovered for coming February 1st. 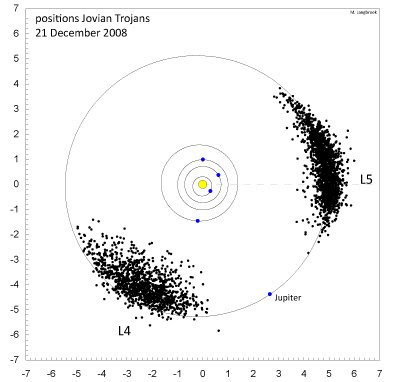 The new Trojan is the one currently just outside Jupiter's orbit in the top plot. A full list of my asteroid discoveries can be found here.